Keep fresh water available for your livestock this winter with the Farm Innovators Submersible Plastic Tank Deicer with Guard. This deicer is thermostatically controlled to operate only when the water temperature drops below freezing, and the unit turns off according to the internal thermostat shut-off temperature. This compact unit rests in the bottom of your tank, where it is less likely to be disturbed by your livestock. 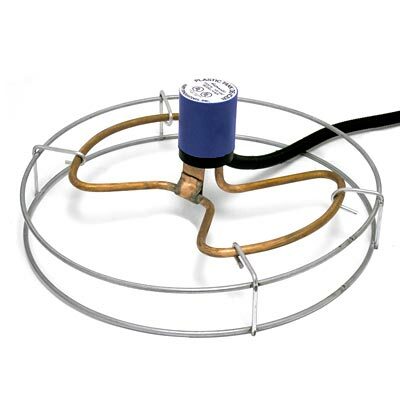 The galvanized wire guard surrounds the heating element and prevents livestock from injuring themselves. This unit uses 1,500 Watts for power, and features a tubular heating element which is safe to use in plastic, structural foam, or metal tanks, as well as ponds made from liners or preformed plastic. Offer your livestock fresh water year round with the Farm Innovators Submersible Plastic Tank Deicer with Guard. One year limited warranty.